This past weekend we went over our friends’ house, and we brought some appetizers. 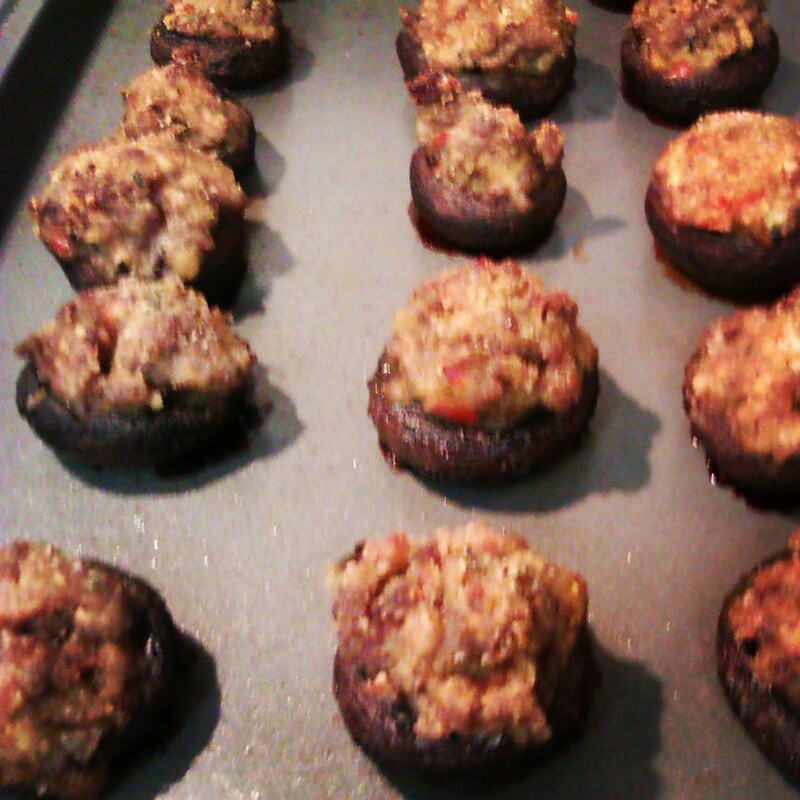 I made some delicious little stuffed sausage bella mushrooms. These little guys are a crowd pleaser. The problem you will have is keeping them on the table, so make sure you prepare extras. There are so many different types of stuffed mushrooms, the stuffing possiblites are endless. So have fun and get creative. I hope you enjoy. Heat a large skillet over medium high heat. Add olive oil and mushroom caps . Saute caps 5 minutes, until they are tender on edges. Turn caps around and let juices drain away from caps. Place caps on a nonstick baking sheet. Afterwards, Add a touch of oil and sausage to same skillet. Brown and crumble sausage for 3 to 4 minutes. In a food processor pulse garlic, mushroom stems, bell pepper, basil, and onion. Pulse for about 1 minute. Remove mixture from the processor and saute veggies with cooked sausage for about 4 to 5 minutes. Add bread crumbs and cheese to the pan and toss stuffing until bread is moist and stuffing is combined, about 2 minutes. Fill caps with stuffing using a small scoop or small teaspoon. Place caps in hot oven. Bake 8 to 10 minutes until golden crispy top has formed. Transfer stuffed mushrooms to a serving dish and enjoy.